At first impression, one wouldn’t expect “recovered retail food” to affect our members as Next Gen PFMA members do not source “feed grade” ingredients. With strict controls, manufacturers can prevent use of inferior ingredients in their foods – but do you control the ingredients consumed by your ingredients? 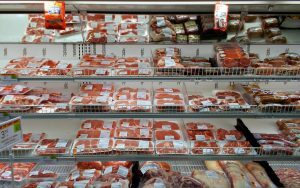 Does your meat broker ensure your meats didn’t consumed retail food waste? Approved at the 2018 summer AAFCO meeting, the official definition states items in the retail food waste category must be free of packaging materials. It would be unrealistic to expect a minimum wage employee from a grocery superstore, or any other retail facility, to remove the yogurt from the plastic container before dumping the expired product into the holding container. Therefore, it’s reasonable to expect plastic and styrofoam will enter the feed supply with this newly approved term; plastic and styrofoam containers contain phthalates, amongst other toxins. Phthalates are endocrine disrupters which transmits through milk into livestock young, as well as human food. Phthalates concentrate up the food chain. Furthermore, food past its “prime” is pro-inflammatory; meaning the omega-6 imbalance in conventionally raised meat will swing even more toward inflammation. Meat that may be pasture-reared may be as inflammatory as if it were grain fed if fed recovered retail food. The point of all of this: our manufacturers work very hard to source high quality ingredients. Now, there is one more criterion our members must ensure their suppliers meet in order to maintain the highest standards. Previous It’s like a march on Washington DC – timing is everything.